Muhammad Ali Jinnah: Quaid e Azam "The Great Leader"
Only a few geniuses are born in one given century, this one was remarkable. Welcome to a short insight to Sir Muhammad Zafrullah Khan's website, we seek to provide with knowledge only known to a few. Sir Zafrulla's heroic fight in the United Nations for the freedom of Libya, Tunis and Morocco is another epic story of selfless devotion to the cause of Muslims. In the Arab world his name has been inextricably linked with the independence of these territories. Many children born in the early fifties were named after him. Mr. Fadhil Jamali, a former Foreign Minister of Iraq, in a tribute on his death last year, wrote in the Tunisian daily, "Al-Sabah" of 10th October, 1985. "In fact, it was not possible for any Arab, however capable and competent he may be, to serve the cause of Palestine in a manner in which this distinguished and great man dedicated himself. What was the result of the debate in the United Nations is another matter. But, it must be acknowledged that Mohammad Zafrulla Khan occupies a pre-eminent position in defending the Palestinians in this dispute. We except from all Arabs and followers of Islam that they will never forget this great Muslim fighter. After Palestine, the services of this man for the independence of Libya also deserves admiration. In the United Nations, his struggle for the rights of Arabs formed the basis of firm and lasting friendship between us." The "Dawn" of Karachi acknowledged in an editorial on September 3, 1985. "He earned the abiding respect and admiration of the Arab and other Muslim nations as a defender of their interests." In a personal tribute, His Majesty King Hussein bin Tallal of Jordan said, "He was indeed a champion of the Arab cause and his ceaseless efforts whether among the Muslim and non-aligned countries or at the International Court of Justice will remain for ever a shining example of a great man truly dedicated to our faith and civilization." No account of Sir Mohammad Zafrulla Khan's service to Islam without a reference, albeit a brief one, to his writings and publications on Islam and Ahmadiyyat. He translated the Holy Quran into English and also the writings of the Promised Messiah. 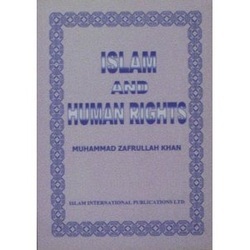 His biography of the Holy Prophet Mohammad, peace and blessings of Allah be upon him, is a testimony to his intense love and obedience to the Prophet of Islam. These publications serve as a most valuable introduction to Islam and its philosophy, particularly for readers in the West. He spent the last year of his life serving Islam through his writings as well as by personal example as a true believer and servant of God. after my health; health was the basis of all achievement. Second, in respect of studies, he advised that whatever lectures in the classroom were due for tomorrow, I should prepare for them the day before. And whatever I learned today, I should revise the same day so that it became forever part of me. Third, I should broaden my mind; in particular, whenever I got theopportunity to make an educational j ourney — or even a j ourney for pleasure —I should take it, for journeying to new places was conducive to a broadening of one's range of interests. My first personal contact with Chaudhri Sahib came in October 1946, when I sailed to the UK to join Cambridge University for studies. Our boat — the P.&O. Franconia — docked at Liverpool. It was a cold and misty morning. Chaudhri Sahib had come to the dockside to meet his nephew who was also travelling on the "Franconia". Chaudhri Sahib was at that time an Indian Federal judge. When we got down from the boat, our heavy cases — my mathematics books which I had packed —• were lying around in the customs shed. There were few porters due to post-war conditions. Chaudhri Zafrulla Khan said to me, "Take hold of the case from one side and I will take it from the other and we shall carry it to the waiting boat train." This was an amazing reception for a humble student, who had never before encountered such gracious unselfconsciousness on the part of a personage so highly placed. We travelled together to London. During the journey he kept pointing out the beauties of the English countryside, of which he was inordinately fond. The weather was very cold. Seeing me shiver, he kindly gave me one of his (enormously heavy) winter coats. This, in spite of 40 years of use, still survives in the family. them as a betrayal of its trust by Britain. The barrage of questions directed at him failed to move him a single inch from his stand. His eyes twinkled, he wore a smile, he waved his cigar, he was all courtesy and urbanity, but he was utterly unyielding. His questioners could win nothing from him. He held his own against all comers. "Having watched the drama for a whole day, the Punjab Muslim Delegate felt that it would serve no useful purpose to cross-examine so formidable an adversary as Mr. Churchill. On the morning of the second day the Secretary of State accosted him before the meeting was called to order and enquired: "Do you intend to put any question to Mr. Churchill?" "No Sir. I consider it would be a profitless exercise." "Well, he is our cleverest debater in the House, and it is no use trying to catch him out on his previous speeches in which he supported Dominion Status for India. You have seen how he gets out of them. Yes, Dominion Status, but status is one thing and function is quite another. India already has Dominion Status. It sent a delegation to the Paris Peace Conference, it is a signatory of the Treaty of Versailles, it is a member of the League of Nations. That is status. But it is not yet ready to function as a Dominion! He thinks India is still what it was when he was serving as a subaltern at Bangalore." of evasion. Thereafter both the examiner and the witness became more alert. The Committee adjourned. and growled: You have given me the two most difficult hours before the Committee. The questioner acknowledged the growl as if it were an accolade and a token of friendship and so it proved. In subsequent meetings the great Prime Minister would every time present him with a volume of his letters or speeches, and the inscriptions beginning with: Inscribed for Zafrulla Khan, W. S. Churchill; went on mounting the scale; To Zafrulla Khan, from W. S. Churchill; To Zafrulla from his friend W. S. Churchill. Magnanimity was not the least among the many great qualities of the great Prime Minister." The amazing thing was that Chaudhri Sahib's memory was faultless, not only about persons, but also about dates and even times of day for matters which had occurred 50 or 60 years earlier. I also recall with great fondness the narration of his United Nations fights with Big Powers for independence of Libya, Morocco, Tunisia and Algeria (described on pages 179-182 of "Servant of God"); likewise, the heart-warming story of his pilgrimmage to Mecca, when he was King Faisal's personal guest, narrated on pages 279-286, was repeated on our request many times. In the retelling of all these incidents in his life, what came across strongly was the greatness of his spirit, his intense love —• bordering on near-veneration — for the Prophet of Islam, and his own complete reliance on Allah and His divine Will. Also manifest was his love of Persian poetry, particularly the mystical verse of Rumi in his Diwan-e-Shams-Tabriz which he could recite without effort from memory. Allah's grace, I am a good advocate, but one judicial case I always lose. That is, whenever I plead to myself for myself." I can not do better than close this note by quoting from the moving end of his book "Servant of God" when he speaks about himself. "His career as a public servant came to an end with the expiry of his second term on the International Court of Justice. He was called to the Bar at the age of twentyone, practised as a lawyer for twenty-one years, held executive office in Indiaand Pakistan for fourteen years, was a Judge, national and international, for twenty-one years, and a diplomat for three years. He has worn many hats, but the one he now wears is the most honorific of all, and brings him the greatest satisfaction. He is now wholly the servant of God, for which honour all praise is due to God. His one care and concern is that his Gracious Master may be pleased with him, and may continue to afford him, for such time as He may, of His grace and mercy, grant him here below, opportunities of serving Him and His creatures, and bestow upon him the strength and ability to perform that service in a manner acceptable to Him. Of his own he has nothing to devote to His service; life, faculties, capacities, means, relations, friends are all His gifts. He supplicates for wisdom and strength to employ all his gifts in His service, to the winning of His pleasure, to the true service of his fellow beings. For himself he only seeks fulfilment in his Gracious Maker, Creator and Master. He hopes for His mercy, His forgiveness, His forbearance. May He continue to cover up all his numberless faults, defaults, shortcomings, vices, sins, disobediences and transgressions under the mantle of His mercy, and safeguard him against humiliation here and hereafter. May He wash him clean of all impurities so that death, when He is pleased to send it, may prove to be a gentle transition from illusion to reality, from faith to fulfilment and utter submission. Amen. All praise belongs to Allah. "Sir Muhammad Zafrulla Khan was a Pakistani politician, diplomat, and international jurist, known particularly for his representation of Pakistan at the United Nations (UN). The son of the leading attorney of his native city, Zafrulla Khan studied at Government College in Lahore and received his LL.B. from King's College, London University, in 1914. He practiced law in Sialkot and Lahore, became a member of the Punjab Legislative Council in 1926, and was a delegate in 1930, 1931, and 1932 to the Round Table Conferences on Indian reforms in London. In 1931–32 he was president of the All-India Muslim League (later the Muslim League), and he sat on the British viceroy's executive council as its Muslim member from 1935 to 1941. He led the Indian delegation to the League of Nations in 1939, and from 1941 to 1947 he served as a judge of the Federal Court of India. Prior to the partition of India in 1947, Zafrulla Khan presented the Muslim League's view of the future boundaries of Pakistan to Sir Cyril Radcliffe, the man designated to decide the boundaries between India and Pakistan. 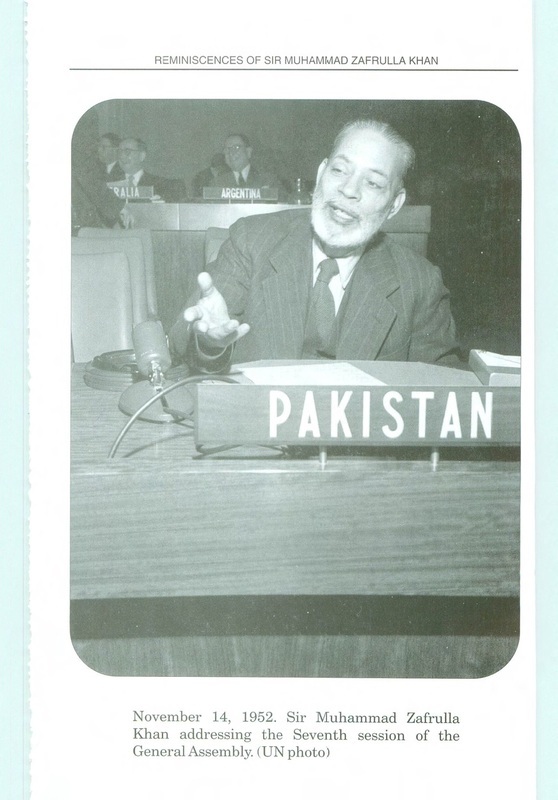 Upon the independence of Pakistan, Zafrulla Khan became the new country's minister of foreign affairs and served concurrently as leader of Pakistan's delegation to the UN (1947–54). From 1954 to 1961 he served as a member of the International Court of Justice at The Hague. He again represented Pakistan at the UN in 1961–64 and served as president of the UN General Assembly in 1962–63. Returning to the International Court of Justice in 1964, he served as the court's president from 1970 to 1973. He was knighted in 1935." There is not one single title or name for a man who in this world fought for justice, freedom, loyalty, the poor, the unvoiced, true equality and first and foremost humanity. Sir Zafrullah Khan was a hero for humanity and today is forgotten only because he belonged to a minority islamic sect, Ahmadiyya. 'KCSI, BA, LLB, Member of the Punjab Legislative Council, Delegate at the Indian Roundtable Conference, Delegate at Joint Select Committee of Parliament on Indian Reforms, President All Indian Muslim League, Member of General Executive Council, Leader of Indian Delegation to the Assembly of League of Nations, Agent General of India in China, Judge at the Federal Court of India, Constitutional Advisor to H.H. The Ruler of Bhopal, Foreign Minister of Pakistan, Pakistan's delegate to the United Nations Security Council on India Pakistan Dispute and Sessions to of the UN General Assembly, Pakistan's delegate to San Francisco Conference on Japanese Peace Treaty, Pakistan Delegation to SEATO Conference, Judge of the International Court of Justice Hague, Vice President, Permanent Representative of Pakistan to United Nations, President of the 17th Session of the UN General Assembly, Honorary Bencher at Lincoln Inn, Fellow of London School of Economics, Honorary LL.D. (Cambridge), Honorary Fellow, Delegacy of King's College London, LL.D University of Columbia, Denver, California.' (Source: 'The Reminiscences of Sir Muhammad Zafrullah Khan', Interviews Conducted by Professors Wayne Wilcox And Aislie T. Embree For Columbia University - With an Introduction by Prof.DR.Pervez Perwazi 2004, pp.xiv). generates friction, and in terms of social values that means difference and very often dispute. Difference, or let us say, the right to differ, lies at the root of all knowledge, inquiry investigation, research and progress. While, therefore, we must strive to safeguard the right to differ, to question, to dissent and on iccasion even to protest, we must at the same time strive to secure that our differences, in every sphere-religious, philosophical, scientific, social, economic, political or whatever, should act and react beneficently and not destructively". Sir Muhammad Zafrulla Khan: Islam means peace through submission to the will of God. I am a Muslim, that is, one who believes in Islam and hence submits himself to the will of God. I believe that all things proceed from God and depend upon him for support and sustenance. I believe He needs no support; He neither begets nor is begotten. He has no partner and no equal. I believe in God’s angels as the agency through which He communicates with His creatures, and I believe that from time to time that revelations from God have been delivered for the guidance of mankind. I believe in all of God’s prophets—Noah, Abraham, Moses, Jesus, Buddha, Krishna—and that the Holy Prophet Muhammad on whom be peace was the last law-bearing prophet. I believe Jesus did not die upon the cross but was taken down from the cross and revived. Thereafter, he journeyed eastward, reaching to the scattered tribes of Israel and died in Kashmir, where his tomb is still preserved in Srinagar. I believe that subordinate prophets will continue to arise in Islam when mankind strays from the path of righteousness and needs divine revelation. It is necessary that, as the pattern of human life develops, mankind should have a living example set before them of a life utterly pure and devoted to the service of God and man. I believe in the resurrection of the soul and the life after death. I believe that the object of man’s existence is to seek union with God through the cultivation of divine attributes in himself. I believe that man has been endowed for this purpose with appropriate capacities and faculties. The right and proper use of these capacities and faculties promotes beneficent development and leads to the state known as salvation. I believe in the brotherhood and equality of man. I recognize no division or privilege based on race, color, family, or wealth. The only badge of honor and nobility that I recognize is the purity and righteousness of a man’s life. My life is guided by this faith and by the following rules. Whenever I feel lonely, weary, or discouraged, I must turn towards God for companionship, comfort, and help. He is ever-near and will not fail me. I must make my heart His shrine and temple and let Him ever dwell in it in sweet guardianship and companionship. I must stand up for truth, righteousness, fair dealing, and justice. I must stand with God, though I may have to stand against the whole world, and I believe the love and fear of God are the sum of all wisdom. Chaudhri Muhammad Zafrulla Khan was one of the greatest human beings I have had the privilege and good fortune of knowing in my life. I saw Chaudhri Sahib first in December 1933 on the occasion of the annual gathering. I was then around eight years old. I can still see him in my mind's eye as very handsome figure with a most impressive bearing. I believe the first occasion when he knew of me was when my father wrote to him in 1940 seeking his advice about my future career. He wrote in reply that he would pray for me and he offered three pieces of advice. First, that I should look after my health; health was the basis of all achievement. Second, in respect of studies, he advised that whatever lectures in the classroom were due for tomorrow, I should prepare for them the day before. And whatever I learned today, I should revise the same day so that it became forever part of me. Third, I should broaden my mind; in particular, whenever I got the opportunity to make an educational j ourney — or even a j ourney for pleasure —I should take it, for journeying to new places was conducive to a broadening of one's range of interests.